A fairly forgotten classic turned into a beautiful performance piece for any group. Includes the script, full instructions, and a performance video. One of the more difficult tasks facing magicians is coming up with scripts - of any sort. How do you explain to an audience in a reasonable manner how and why this fabulous magic is happening? 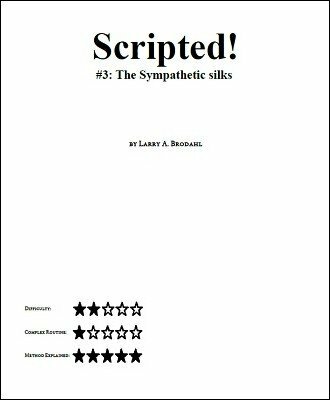 Well, the author of How To Write A Script shows you how he used his methodology to write a script that successfully explains...in a bare minimum of script...the Sympathetic Silks. Part of the scripts' charm is that the audience sees a trick performed in just FOUR words. This ebook and the video of a live performance gives you every line, joke, piece of timing, setup and nuance of the routine. The ebook also takes you through the an overview of the steps of script writing. This routine has been performed for audiences of all types and ages. NOTE: The routine does rely for some of it's humor on a bit of word play that may not exist outside of English, but it is NOT vital to the performance. 1st edition 2016, 29 pages + video.